Students at Kelly Elementary practice for a performance with the Pittsburgh Symphony Orchestra at the now-closed Wilkinsburg High School. 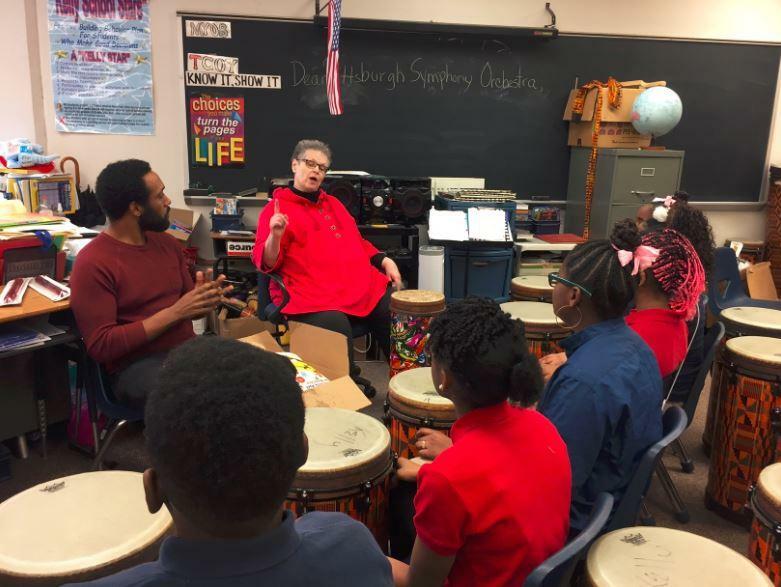 On a Wednesday afternoon in Wilkinsburg, Kelly Elementary School music teacher Lois Clark wrangled a dozen fifth and sixth graders into her classroom. The students use their recess time each day to prepare the songs they’ll perform at a concert alongside the Pittsburgh Symphony Orchestra this week. Every year for more than a decade, the PSO has performed in Wilkinsburg to benefit the district’s music programs. Last year, the high school shut down, including the auditorium where the symphony usually performs. On Thursday, March 23, the space is reopening for what may be the last time. While practicing, the students sat in three rows to practice playing African drums, while singing a riff of the big band standard “Swing, Swing, Swing,” called “Spring, Spring, Spring,” which is the theme of this year’s community concert. The exterior of the now-closed Wilkinsburg High School. The school's auditorium will open one last time so that Kelly Elementary School students can perform with members of the Pittsburgh Symphony Orchestra. There to help them was Terrell Moss, a percussionist with the symphony. He taught students about swing beats and tapped his drum while they mimicked him, patting the rhythm on their laps. He also shared a little performance advice. Still, some students had mixed feelings. Fifth-grader Hope Johnson said she felt a little bit of everything. “Excited, nervous, scared,” she said. For fifth-grader Aneiah Barnett, the sheer size seemed overwhelming. But right now, that big stage in Wilkinsburg High School is empty. Entering the now-closed auditorium is like walking into another era. It was built in 1929 and has an ornate hand-plastered ceiling and carved wooden walls. 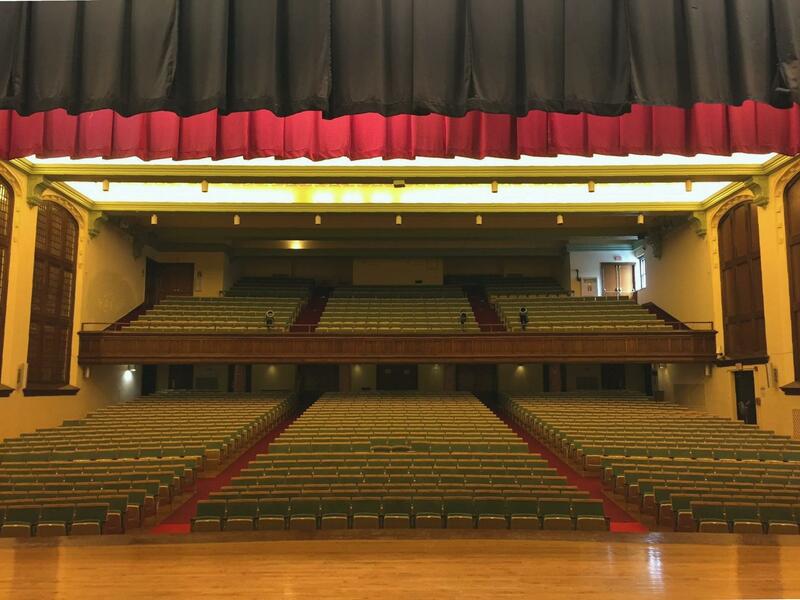 Built in 1929, the Wilkinsburg High School auditorium features ornate designs, such as hand-plastered ceilings and wood carvings. 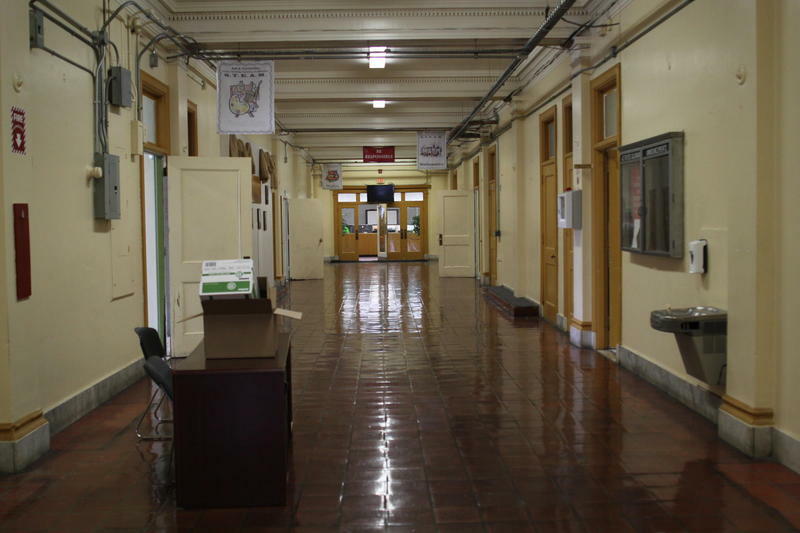 “We used to have pep rallies in here. They used to do plays, show movies, put on musicals,” said Wendy Fowler, a maintenance worker for Wilkinsburg School District and an alumni of the high school. She said the school is locked down, but they keep the heat on low to make sure nothing freezes. Fowler said she’s never watched any of the PSO concerts held at the school. But since this year might be her last chance, she said she plans to be there Thursday. Suzanne Perrino, who works on the symphony’s community programs, said she hopes everyone will attend the concert. The PSO has partnerships all over the region, she said. 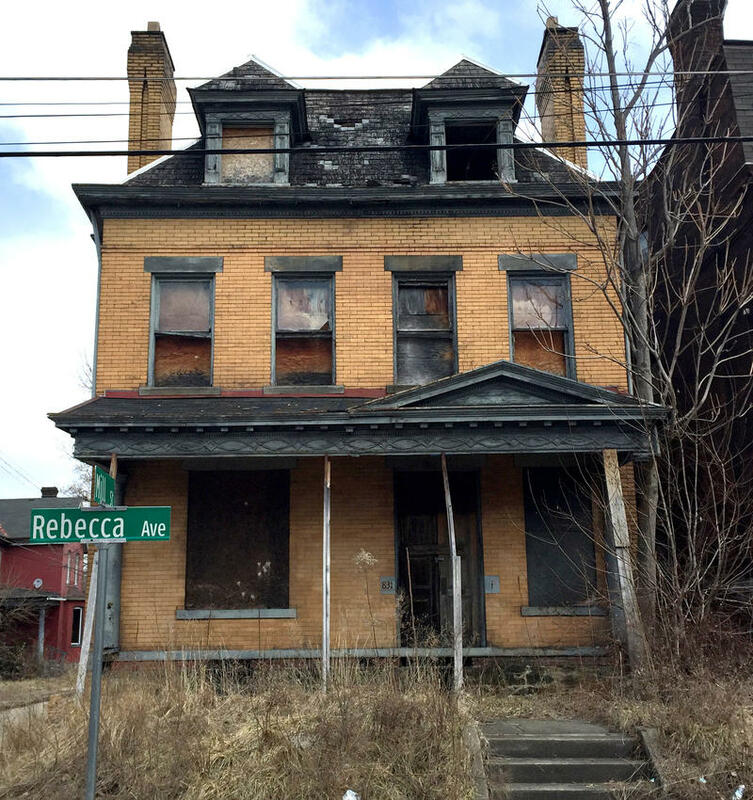 “But right now, our focus really is mostly on Wilkinsburg,” she said. Perrino said the community concert is the highlight, but throughout the year, students go to concerts downtown and the musicians, called music ambassadors, visit classes. “Because they are the ones that are producing the music, they’re the ones that are passionate about the music," Perrino said. 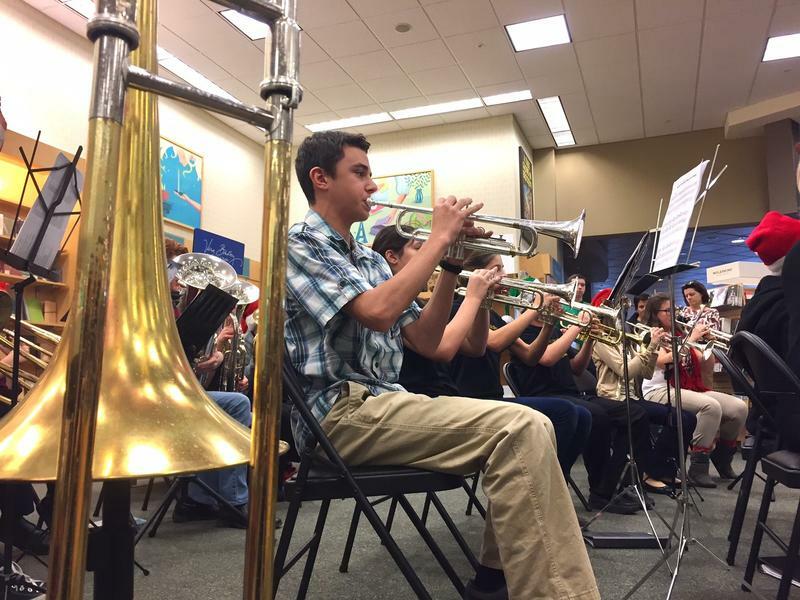 "They can share that passion, they can give insight and really inspire kids to not only be musicians, but to be more well-rounded human beings." For Wilkinsburg, partnering with the PSO has also been an opportunity to address the changes in its school district. Kelly Elementary students used to move on to Wilkinsburg High School, now they go to Pittsburgh’s Westinghouse High School. 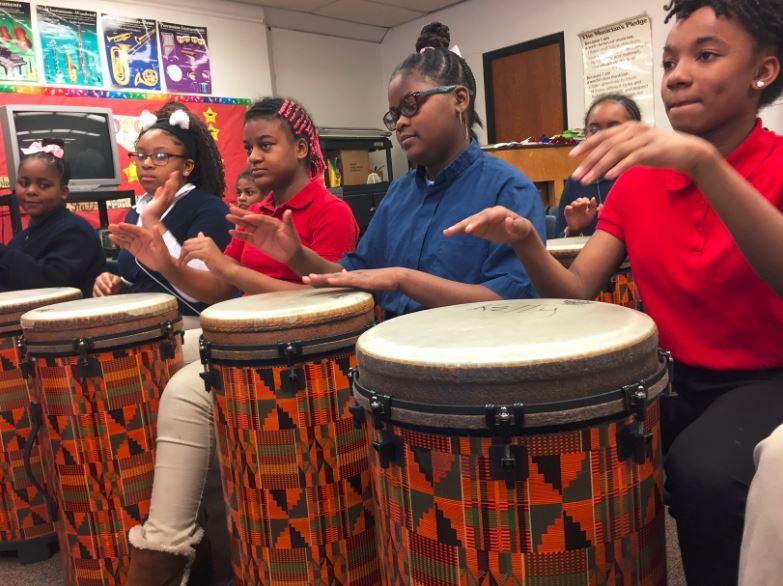 Earlier in 2017, sixth graders from Wilkinsburg and Westinghouse took a trip to Heinz Hall together for a concert, lunch and percussion workshop. Perrino said the concert series will continue, even if the PSO has to find another venue. Longtime Kelly Elementary School Teacher Lois Clark (center), with Terrell Moss, advises students before their performance Thursday. Clark will retire this year after 18 years. But one change is certain: Clark, the music teacher, is retiring after 18 years. She built up the program. Starting from almost nothing, she said, she fought for more materials and opportunities for students. She said she’s sad about leaving and of the uncertain future of the auditorium. “I don’t like to see anything end or close or finish,” Clark said. She said she does hope the students continue pursuing music and remember the year with her. She said she dreams of them telling their kids about what they accomplished. But many of her students already said they value the experience. And sixth grader Jamie-Ka Tab said she’ll continue pursuing music, because she loves it. Clark said she hopes the end of this era is a stepping stone. She said she plans on coming back to Kelly to check in, and help any way she can. Albert and Jen Wolf love the sound of their daughters practicing their instruments at home, but that wasn’t always the case. “When they first begin, it’s a lot of very unusual sounds and you’re not sure what’s coming out of that instrument,” Jen Wolf said. 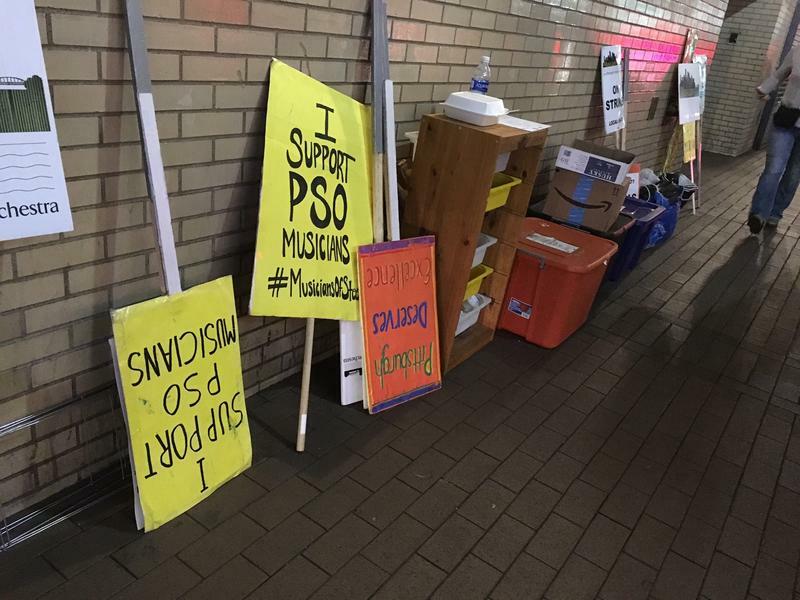 The musicians of the Pittsburgh Symphony Orchestra ended their strike Wednesday. After months of tense negotiations, musicians and management agreed to a new five-year contract, which calls for a 10.5 percent salary cut in the first year.